This winter I returned to Lancaster, Pennsylvania to celebrate Christmas with my family. While there I had the opportunity to attend a lovely event at Rock Ford Plantation, the 1790s home of General Edward Hand. The house is one of my favorite museums to visit. It is beautifully decorated according to how it looked during the years that the Hand family lived there (1790s to early 1800s). Many of the walls are painted a vibrant blue to match the original paint color - it's truly stunning. 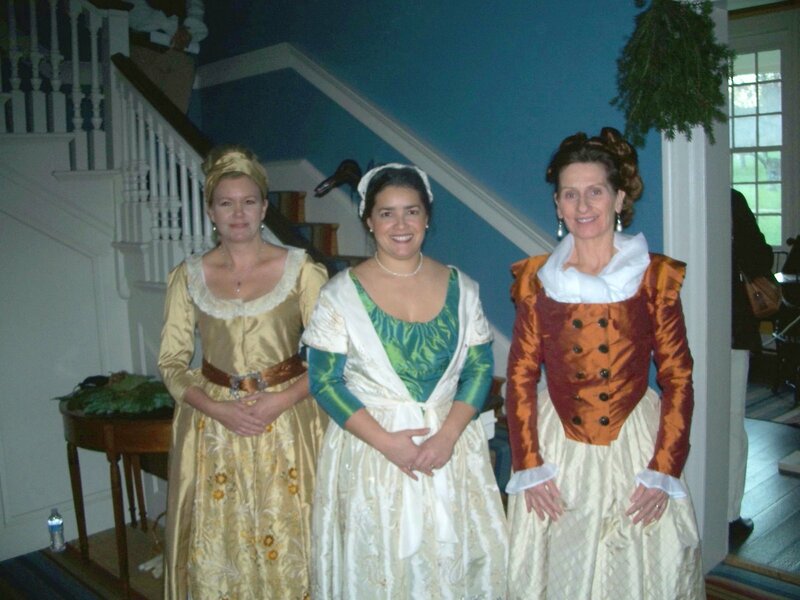 The Rock Ford docents try their best to replicate the clothing worn during that era in history. 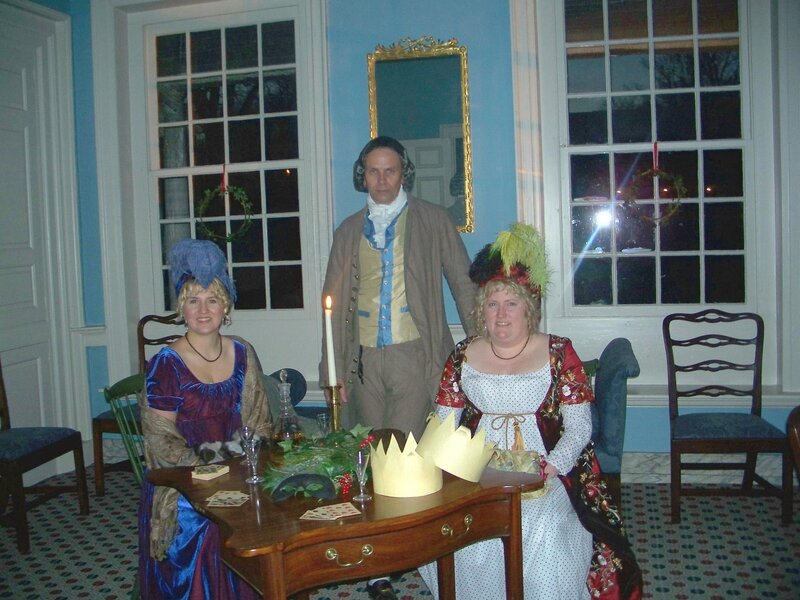 It is always enjoyable to visit their candlelit evening events to see them dancing in the hallway to live music and enjoying a game of cards in the parlor, while below stairs docents portray servants cooking in the working hearth (another activity that I had the chance to participate in this winter). Unfortunately, I was not able to dress in period attire for the occasion due to another activity the same evening, but I did get the chance to stop in and be inspired by the clothing of others. The ladies above, Pam, Cindy and Nancy (my mother) each created their own attire. My mother made this reproduction of the white and red striped 1790s jacket from the Kyoto Costume Institute's book 'Fashion'. Her jacket is made from a lovely pumpkin orange silk. The skirt is ivory with a diamond pattern woven into it. 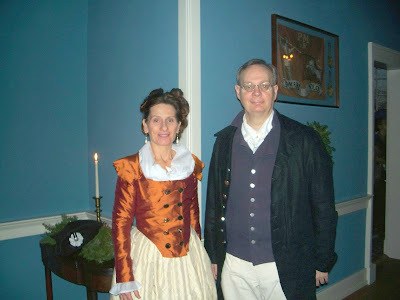 Here she poses with Tom, a fellow docent. Two very stunning Empire style gowns. The lady on the left is April Thomas of www.18thcenturygowns.com. She is attired in a lovely changeable blue-purple silk velvet gown. It looked a gorgeous deep blue in person. The muff was made by April and was constructed from diamond pieces of real fur. It was inspired by period images of similar muffs. There was a fad for harlequin items in the 18th century inspired by the diamond costumes traditionally worn by the comic Harlequin character in the Italian Commedia dell'arte. 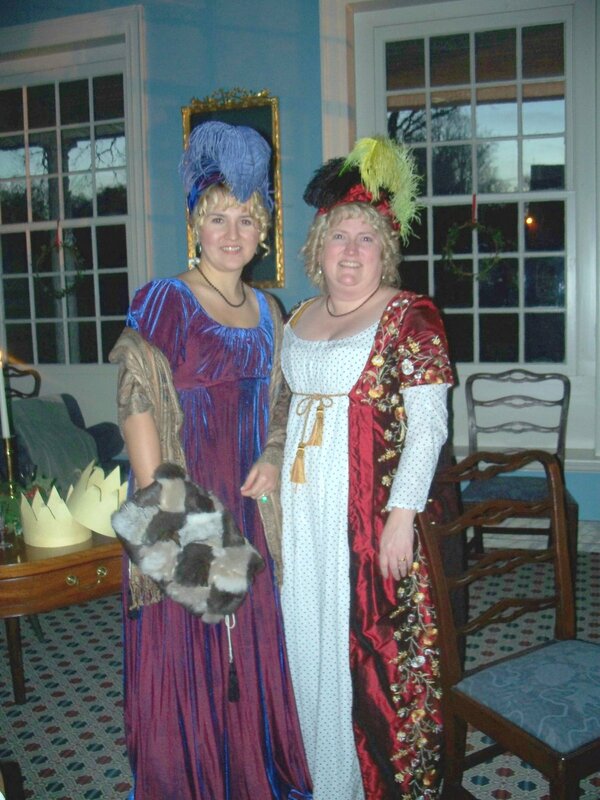 Andrea, on the right is wearing a red embroidered silk robe with a lovely sheer white gown. She is fortunate enough to have a husband who creates her wardrobe for her while she crafts stunning reproduction jewelry pieces that can be found at www.ameysadornments.com. Andrea's turban headdress was made by Miller's Millinery. 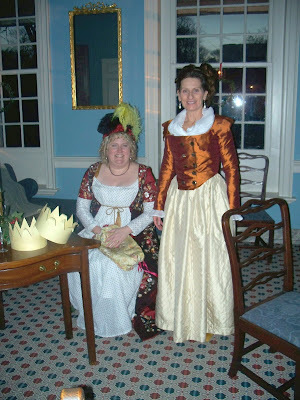 Above: Andrea and Nancy in the formal parlor. 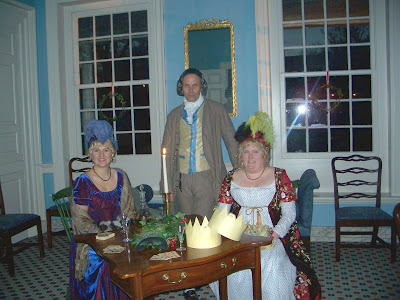 Below: April, Mark and Andrea in the formal parlor. Yuletide at Rock Ford was an inspiring event as usual. Once a month Rock Ford holds a Tavern Night in the historic barn on site that includes dinner, dancing and a great opportunity to wear Revolutionary War era clothing. The event can be attended in modern dress as well. This summer Rock Ford will be hosting a huge Revolutionary War Reenactment on site. The Lancaster County Park where the Plantation resides is an excellent location for such an event because it is completely secluded from modern life and offers the chance to go back in time. Some of my particular favorite moments of the event are - the fall leaves that are always at their peak of beauty at the time of the reenactment, lovely costumes worn by docents and reenactors, and the vendors - of course. If you are in the area and have a chance to attend this event as a spectator or reenactor - please do, it is a wonderful event. This year, I will once more be costuming the fashion show and also look forward to making myself a new gown for the occasion. I love to hear about events where people can attend who aren't members of a specific re-enactment group. I only wish I lived closer. Love this post, Lindsey. Your mum looks stunning as ever. Her ensemble is just beautiful!